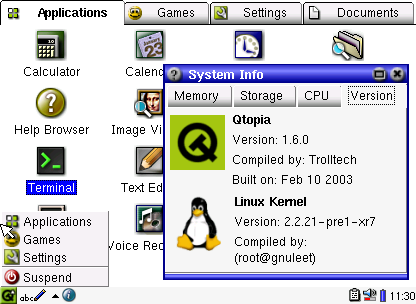 Qtopia is a platform for embedded Linux-based mobile computing devices such as personal digital assistants and mobile phones. It was developed by Trolltech. Great!! !The project continue, but which are the changes of this version? Well done :o)! But i�ve a question: i miss the Opera browser in the application menu :o( ! After searching the sourcecode of Qtopia, i found the Opera "O"-Icon, but i can�t find it in the menu...Is it my fault or didn�t you include it? The last time I tried out Qtopia (2.1.1), it did not recognize when an SD card was inserted. Does it do so now? Thank you. Sorry I didn't think about that enough. It's about hotplugging SD Cards? I've disabled SD hotplugging because it's so dangerous when Qtopia running on SD Card. I'll try to modify it later, thanks. When an SD card is plugged in, Qtopia (according to the documentation) is supposed to scan the card for "documents" (text, pictures, video, audio). These documents are then available in the applications. Thanks. Add-on to my last comment: if this feature is implemented, then users are forced to keep all pictures, video and audio in NAND, which is impractical. Thanks. Another add-on ... I meant, "if this feature is NOT implemented." ;-) Wish we had the ability to edit comments! Thanks. where i can find the source code? Please, add Opera browser to next edition, i have just figured out how to connect PC with WiZ and installed SSH... But i would still like to have the Opera browser - i can ping everywhere on the net, i have got my DNS set, but it's useless without web browser! Opera doesn't seem to work anymore. It just crashes. =( Could you include it to next release please? ?